Iran and Russia have agreed to work together within the framework of a Moscow-led Eurasian Economic Union (EEU) following three years of discussion and negotiations on free trade. Kazakhstan, Belarus, Armenia, Kyrgyzstan and Vietnam. Iran’s inclusion into the EEU will help it access markets that may have been previously blocked due to US sanctions. Once ratified, Iran will be expected to establish a free trade zone for EEU trade. In 2015, Iran and Russia signed a joint monetary agreement to facilitate mutual trade transactions of Iran’s rials and Russia’s roubles. In the first two quarters of 2017, Iranian exports to Russia soared 36 per cent reaching $228 million, according to official statistics in Tehran. But imports from Russia fell from $594 to $509 million between the first half of 2016 and the same period in 2017. In recent years, both Iran and Russia have found that their trade and strategic ties have become more aligned, particularly as both countries fall under US sanctions. Both countries support Syrian President Bashar Al Assad and have provided support to his forces to defeat Islamist rebels in Syrian cities. Iran also credits the Russian negotiating team and nuclear experts for making significant contributions to the drafting of the comprehensive arrangements, which made it possible to align the different, often opposing views, in order to sign the nuclear deal in Vienna, Austria in 2015. 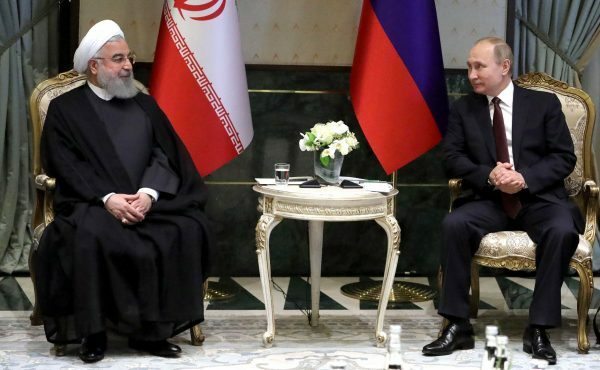 Russian President Vladimir Putin most recently met Iranian President Rouhani in Ankara, Turkey where the two leaders had convened with their Turkish counterpart Recep Tayyip Erdogan to hammer out a joint strategy on how to stabilize Syria. Iran has also been making strategic inroads with other economic giants in Asia. In February, President Hassan Rouhani was in New Delhi to meet with Indian Prime Minister Narendra Modi to sign nine new trade agreements. The agreements include the development of the strategic port of Chabahar in Iran. India intends to lease two berths at Chabahar for 10 years. The port will be developed through a special purpose vehicle (SPV) which will invest $85.21 million to convert the berths into a container terminal and a multi-purpose cargo terminal. The port of Chabahar in southeast Iran is pivotal to India’s efforts to open up a route to landlocked Afghanistan where it has developed close security ties and economic interests.